*There are affiliate links in this post. If you click through and make a purchase, my guest may receive a commission at no additional cost to you. I’m delighted to introduce you to a lovely friend of mine. This is the woman I reach out to when I need advice about the acting industry for Brooke (since her boys act too) or need to talk to another Modern Martha about juggling creative projects. Amber Lia is co-author of the popular parenting book, Triggers: Exchanging Parents’ Angry Reactions for Gentle Biblical Responses. She has a new book out too, just in time for summer! 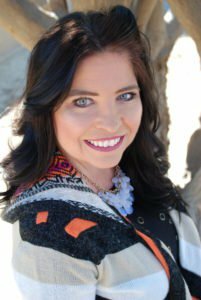 Let’s give this Californian mom a warm welcome as we talk about God’s Word shaping our lives and the lives of our children. There are plenty of things to be joyful about as a mom, but when my first three sons were running circles around me, I had to search hard and long for my joy. I spent a lot of time beating myself up for my messy house and exasperated state of mind. I had three sons who were 4-years-old and under and I was living in a new town with no family to help and only a few acquaintances. I had an enemy in this new town too: myself. I was my own worst critic. Growing up, my home life was fraught with tension. As the years went by, I learned that the one and only thing that saved me from drowning under the weight of my emotions was the Word of God. My parents, for all their own issues, did the best thing for me a parent can do. They helped me memorize and study Bible verses from the time I could talk until I graduated from High School. One thing was certain—I knew what the Bible said and it helped guide my life as a teenager and young adult more than any other influence. When I look back on those days of early motherhood, the period of self-loathing didn’t last long. It could have sunk me, but all those years of Bible study enabled the voice of God to drown out my doubts and fears. Was I becoming too impatient? Yes. Did I feel overwhelmed? Yes. Did I feel lonely? For sure. But I also recalled the many Scripture verses that God planted in my heart, and His voice won out. I began to make quiet times a priority again. My prayer life rejuvenated as I prayed through God’s promises for my life. Change, by the grace of God, flooded my heart. 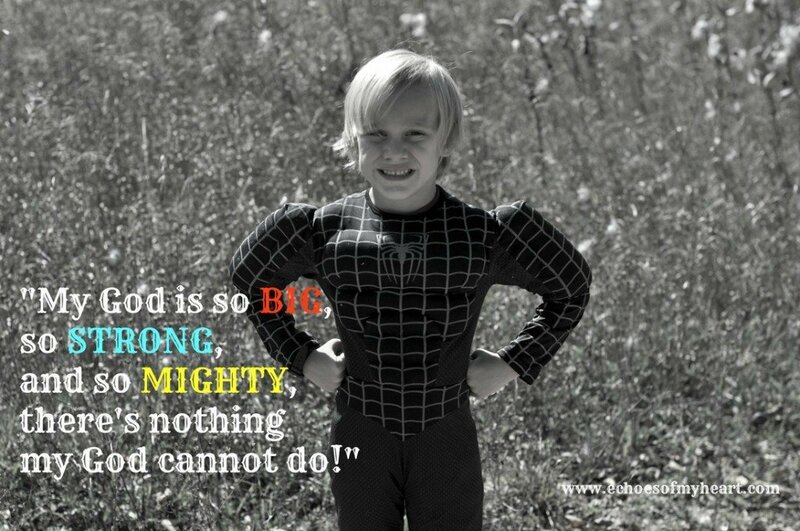 The grace that saved me from my sin at a young age began to strengthen me and draw me to the Lord in new ways as a mom. I was forgiven then, and I was forgiven now. God was ready and eager to give me what I did not deserve. He enabled me to become more like Him, offering grace to my children to grow and mature. Each day became something to delight in again. The behaviors that once frustrated me in my kids became beautiful challenges that I got to help guide them through as a loving mom, just as my Heavenly Father was doing for me. Now that my oldest son is 10-years-old and our family has grown to add our newest baby boy, bringing our “testoster-home” to four sons, I have seen the importance of passing down my parents’ legacy to my own children. It was the Bible, rooted deep in my heart and mind that caused me to run to Jesus when my life was not what I expected. It was God’s Word that gave me wisdom as a mom, and it was the Bible that encouraged my heart and gave me hope. There was no way I was going to miss that opportunity with my boys! I designed daily Bible studies with all my years of teaching experience in mind. My kids LOVE going through the Bible with me. They even ask me every day if we can do our Study Buddy Bible Study Guide together. There is nothing sweeter than our discussions about God! And now, the first topic in the series that I studied with my kids is available for parents like you too—just in time for summer! 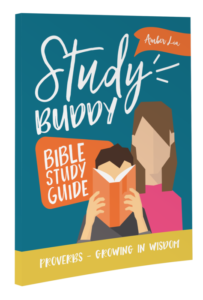 The Study Buddy Bible Study series is for every parent who wants their child to develop the life-long habit of studying Scripture. Full of simple yet practical applications, this study on the book of Proverbs focuses on 20 key verses about wisdom that teach kids how to use good judgment on a daily basis. Designed to take just 10 minutes a day, this collaborative study is a wonderful way to reach your child’s heart without being overwhelming. – Parent/child questions to spark lively conversation. This study guide doesn’t follow a “teacher-student” format — instead, you’ll learn side by side, as Study Buddies! This Proverbs study covers ideas like protecting your heart, doing good to others, taking care of animals, avoiding gossip, not starting a fight, and obeying parents. It’s ideal for ages 7-12, but can be adjusted for younger kids too. You can grab your own copy here on Amazon! The grace of God was more than enough to turn my mothering from stressful to joyful but only because of the Truth that my parents hid in my heart as a child. That’s what a legacy is all about. I hope this series will bless you in unimaginable ways as you do the same for your family. A former high school English teacher and best-selling author of Triggers: Exchanging Parents’ Angry Reactions for Gentle Biblical Responses, Amber is a work-at-home mom of four little boys. She and her husband, Guy, own Storehouse Media Group, a faith and family-friendly television and film production company in Los Angeles, CA. When she’s not building sand castles with her boys on the beach in Santa Monica or searching for Nerf darts all over her house, you can find Amber writing here to spur others on with biblical truth and practical insights! I’m so glad Amber could join us today! What are some summer activities you are doing this year? I enjoyed your story, Amber. I’m a mom of two boys and one girl. I also had a difficult childhood, but I am so thankful for my Christian church and school. I learned to memorize scripture, and it helped me navigate parenting challenges as well. Blessings to you and your ministry.